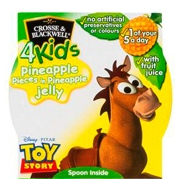 When Crosse & Blackwell got in touch asking if Spud would like to try out their range of Toy Story jelly's containing real fruit pieces, I snapped up the chance as Spud loves jelly and fruit! 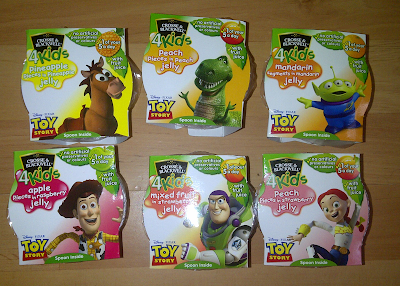 The bonus of it all was the packaging has different Toy Story characters on each one! 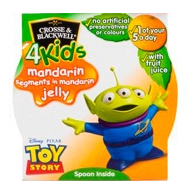 Each 4Kids fruit jelly pot is 125g and they are suitable for vegetarians. As jelly is made with gelatine as some of you will know, vegetarians find it difficult to find jelly suitable for their chosen lifestyle. 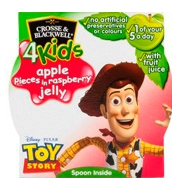 I know this because half of my family and veggies, and was shocked when I told them the 4Kids fruit jelly pots are veggie! 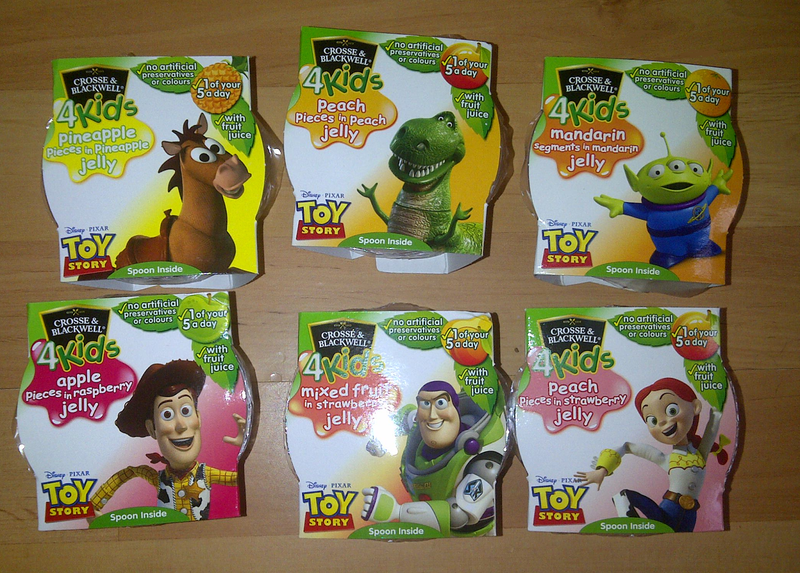 My cousin told me she gave up looking at jelly products a few years ago after finding nothing suitable on the market, she now knows otherwise. Dried peaches in strawberry flavour jelly made with strawberry juice from concentrate. 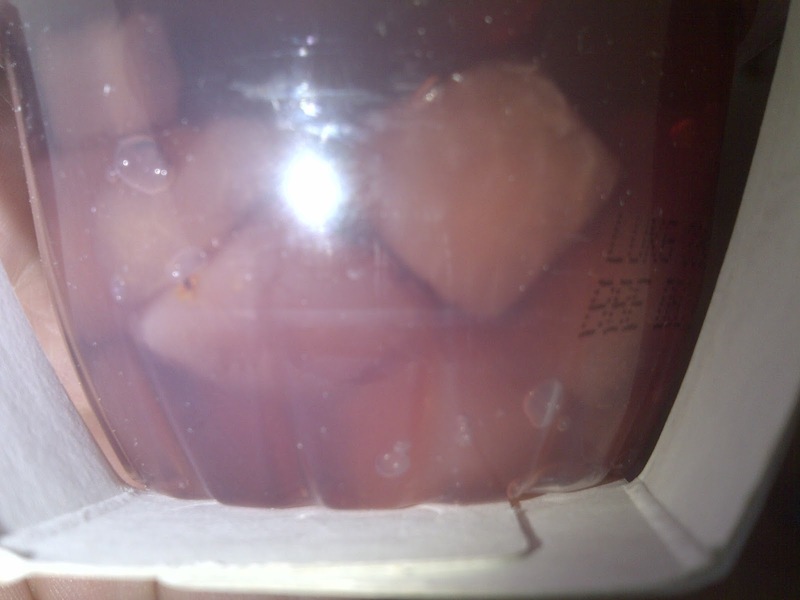 Dried apple in raspberry flavour jelly made with raspberry juice from concentrate. Dried peaches in peach flavour jelly made with peace juice from concentrate. 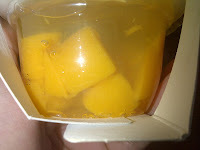 Pineapple pieces in pineapple flavour made with pineapple juice from concentrate. Peach & pear pieces in strawberry flavour jelly made with strawberry juice from concentrate. Mandarin segments in mandarin flavour jelly made with mandarin juice from concentrate. 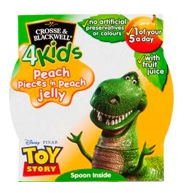 Perfect for a snack or a lunch box treat! 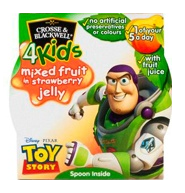 The fruit jelly pots are visably see through, making it clear for you and your child/children to see what's inside! Another thing that I like about the fruit jelly pots is once you open them, if your child does not finish them straight away, you can keep them refrigerated & consume within 2 days. 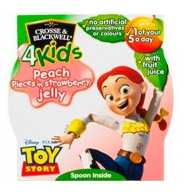 The Crosse & Blackwell 4Kids fruit jelly pots are sold with a suggested RRP of 65p per pot, they are available to buy from Asda, Tesco, Morrisons and The-Co-operative. To find out more about Crosse & Blackwell visit the official website here.